Windows and Excel are registered trademarks of Microsoft Corp. 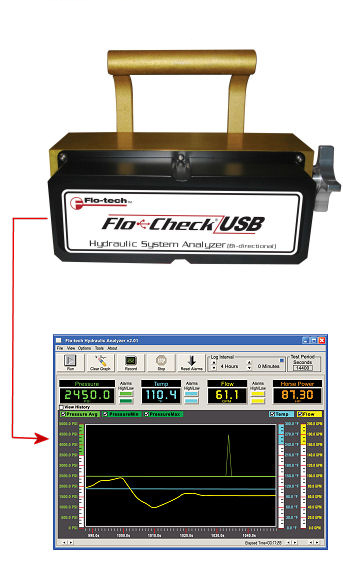 The Flo-Check Hydraulic System Analyzer can be used as a stationary or portable tester for both industrial and mobile hydraulic system diagnostics, and analysis of the prognostic health of a hydraulic system. It features flo, pressure and temperature sensors that are monitored by a data acquisition module. This module records the operating parameters of the system and transfers them to the user’s laptop via the USB port.